Black History Month is an annual celebration of achievements of Black community members within Canada and abroad. Communities across the country hold festivals and events to focus our collective attention on the role that Black individuals and communities have played in building a stronger, better, more diversified Canada. Black Canadian workers have always been at the forefront of social change in Canada, from helping establish unions across the country to resisting attempts by employers to divide us based on race and ethnicity. 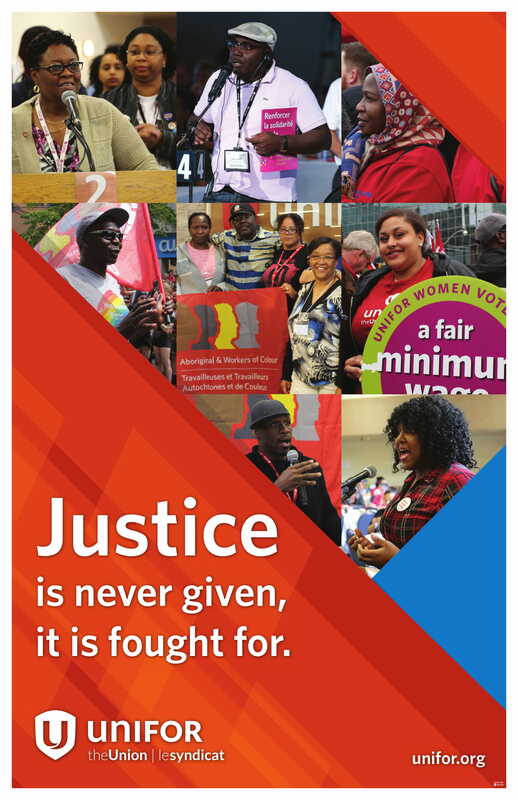 Unifor celebrates the strength, activism and solidarity of black labour in this country. As part of Unifor’s continued commitment to equity, diversity and inclusion this past year the union held national roundtables across the country to discuss combating racism and Islamophobia. The roundtables brought together representatives from a variety of social justice organizations, grassroots advocacy groups, labour activists, academics, and government representatives, with the goal to engage in open discussions in combating racism and the role the union can play to forge better alliances with Black and marginalized groups. During the roundtable members developed concrete strategies and tools that they can bring to their workplaces and communities. Members left the roundtable feeling motivated, inspired and supported to become active anti-racist allies and activists. During this month we will push ourselves and others to recognize that barriers remain and that it is our collective obligation to remove them. We will stand up against racial profiling, unequal justice, and economic and social exclusion and acknowledge that racism, discrimination and inequality persist. We will shine a light on the experience of persons of African and Caribbean descent so that we can learn from our history, including recent events. This month, next month and every month after that, we will work to ensure that our sisters and brothers know that we are unwavering in our pledge to make every person an equal participant in our social, political and economic institutions. As February unfolds, each week throughout Black History Month, we will profile a different member from across the country, highlighting their activist contributions and those who inspired them. Members and locals are encouraged to participate in and promote Black History Month events in their communities or consider hosting a Black History Month celebration in their halls.